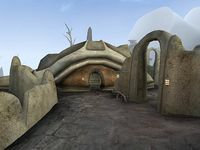 The Maar Gan Outpost is a tradehouse on the west side of Maar Gan, across from the silt strider tower. Along with the Andus Tradehouse, it is one of only two commercial establishments in Maar Gan. A variety of services are provided here, including two trainers and two merchants, one of whom is also a blacksmith, and the other of whom sells Spells and spellmaking services.